Home Carolina Shade Sails Blog Moonrakers -Rooftop Dining under the Sails! 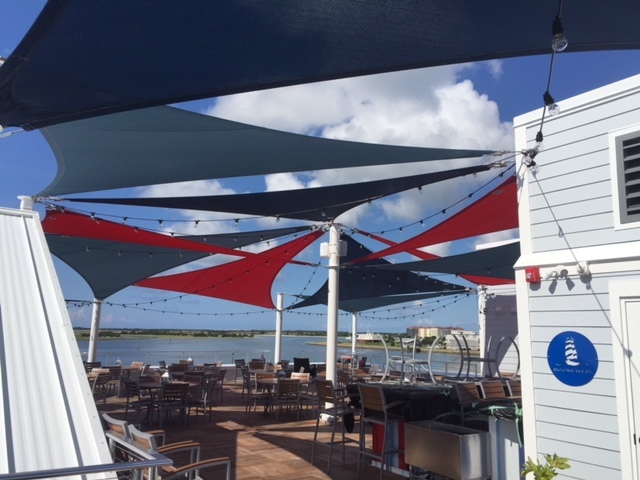 Carolina Shade Sails is pleased to partner with Moonrakers in announcing the completion of the restaurant and the rooftop dining with the shade of 13 sails! Make Moonrakers your next dining destination! “Moonrakers,” named after the rectangle sail flown at the uppermost height of a three-mast 17th-century ship, will be a state-of-the-art, upper-casual dining, full-service restaurant with rooftop dining and bar lounge area located in the Beaufort Historical District. A dining destination offering friendly, neighborly service, along with excellent food, Moonrakers Coastal Cuisine will feature a captivating dining room and bar overlooking the waterfront on the ground floor including 14-foot open ceilings, display kitchen, custom mural, acoustical sails, dedicated wine wall and a wood fired brick oven.